I found an interesting quote on Pinterest. Have you heard of Pinterest.com? If you haven’t, I’m surprised. Pinterest is a photo sharing website. Users can save images or “pins” to their boards. Boards are created around a central topic. When I saw this quote it made me laugh. I immediately “pinned” it to my Writing board! At times I feel like this. Do you like the quote? Can you remember a time when writing made you feel like this? Were you writing for school? Maybe you were venturing out and trying to write a song?! Have you ever heard of Writer’s block? It’s when you don’t have an idea of what to write about, or when you don’t know how to transcribe your thoughts. You lose the ability to write for a while. It can feel like “torture,” so to speak. I know that sounds extreme. But I think the quote is meant to be funny. When you feel like this, it is helpful to walk away – take a deep breath, relax, and come back to it. We all suffer from Writer’s block sometimes. One technique is to let your writing “cool” off. Take a short break or recession, call a friend, make cookies, watch television, or exercise! Getting your mind off it for a little while will help you recover from feelings of frustration. Another activity will help you feel refreshed when you pick up that pencil, or click on the keys of your computer again. I started a Pinterest account and found that I really like “pinning.” Take a look: https://www.pinterest.com/zinahermez/ What do you think? Search for a quote. One that speaks to your heart. It doesn’t need to be on Pinterest but you may use one of mine! You can copy an image into the comments! Don’t be shy! Who knows, you may even start your own board! Zina Hermez authored the book Not Without God: A Story of Survival and created the Spinal Injury Solutions! online website. Zina works as an English Language Instructor, and has been an educator for fifteen years. Her thousands of students have been from many parts of the world, and she’s worked with all ages. Zina writes articles on faith and overcoming challenges, and her stories have been featured in Christianity Today, and the Breathe Christian Writers Conference blog. She has written newsletters, and appeared in medical journals. To learn more about Zina visit http://zinahermez.com. 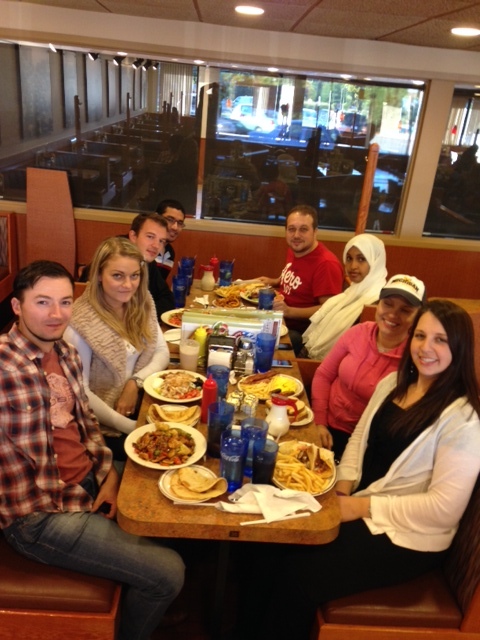 I took my students to the diner on a field trip today! We’re in our fall term at the school where I teach English. I’ve been teaching at the Language Center for almost four years. I have students from various backgrounds and cultures. Some are from Europe, some from Asia, and some from the Middle East. My students would like to further their careers or earn additional degrees, and their goal is to better their English. We listened to an episode by NPR, and the podcast is hosted by someone who interviews people at an all-night diner it’s part of our curriculum design. The morning teacher that has this same section took his students to the diner two weeks ago, and I also wanted my students to experience that. Of course, some of them had already been to a diner before. But we had fun! People sometimes ask if I speak any of my students’ languages. I don’t. My students know English, and they have traveled and been to other countries. They are just at different levels, some novice, some intermediate, some are advanced. This is my Advanced level, All Skills class. My other job is one to one teaching for a global-language-training company, called Global LT. I teach English to business people, managers, and engineers living in the U.S. They are temporarily here on work assignments with their families. Global LT has contracts with automotive companies. My two jobs make a full-time career, and with my writing I have become very busy. But I’m having fun! I’m so excited to have writing as a career now!